I am so excited to feature a fellow member of Team Eco Etsy on today's Eco Friendly Friday. Meet Linda, owner of Fashion Green t Bags, a retired teacher and a lover of the earth. Please enjoy our little "interview" and make sure to stop by her shop afterwards. 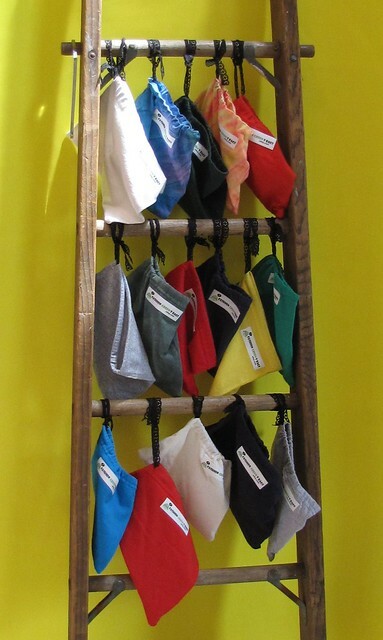 Linda is generously giving away three of her upcycled wristlets. 1. Tell us a little bit about you and your business. I'm a retired teacher and I was looking for something to do with my time to help the community. I have a relative who fell on some hard times and received tremendous help from our local food bank. It was after his crisis was over that I determined I wanted to help others in the same situation. I decided to start this crafting business as a way to raise funds to donate to our local food bank. I donate anonymously so that I don't receive solicitations for further donations or from other charities. I want them to keep ALL the money for food. 2. I love the idea of upcycled bags. Getting away from plastic is SO important and your bags are very creative. Can you give a background on where this creative idea came from? I found out that plastic store bags are called t-shirt bags and that gave me the idea to make the bags from t-shirts. 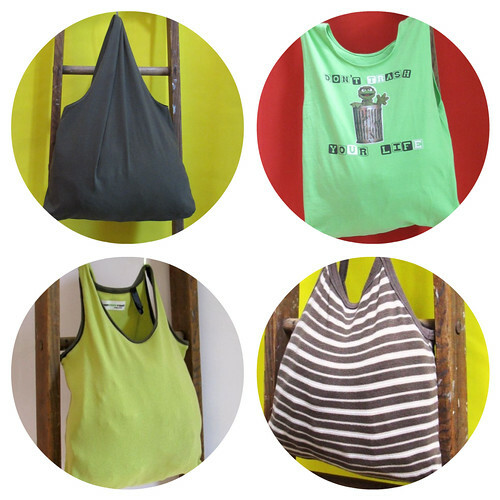 I also use tank tops which I thought of after I'd made a few t-shirt bags because of the shape of the tank tops. My cross-body bags were just an idea I had at some point but I don't recall specifically when the idea for them occurred to me. In making the t-shirt bags I found I had a LOT of sleeves and pondered what to do with those. The idea of drawstring pouches came to me after my daughter gave me a pin that came in a drawstring bag. 3. Many of my readers are young mothers. Do you have any advice you can offer to young mothers to get their kids involved in leading an eco friendly life? Lead by example and tell your children why you make the choices you make. Reading books about being eco-friendly is also a great way to get the message of the importance of eco-friendliness across to young children. 4. What are your top 3 things you do to lead an eco friendly life? I make careful product choices when I buy new items. I consider the packaging and the material from which the product is made before making my purchase decisions. When I can I buy used items because of the cost savings and for the environmental benefit. Maybe obviously I don't use plastic or paper bags when I shop. I always have my bags with me. If I forget one, I put the loose items in my car rather that use a store bag. I use soap nuts to wash my laundry. They're a natural biodegradable shell that contains soap suitable for clothes washing and there is no negative impact on the environment. They also make a great general cleaner if you boil them in water to release the soap. There are many other ways I practice an eco-friendly life and these are three of them. 5. I noticed this on your etsy page "Profits go to food banks" can you talk about this further in detail? In addition to helping my relative at a time of great need I know that the families of many of my former students relied on their assistance as well. With the economy being in its current state, there is a great need in our community for many services and the food bank is one of the services that seems most important to me. No one should go hungry. Thank you SO much Linda for sharing all this great information! Visit Linda's shop Fashion Green t Bags and leave a comment here letting me know your favorite bag, name and email. For additional entries: Follow Fashion Green t Bags on twitter, like on facebook follow Yellow Finch Designs -OR- tweet about this giveaway. Make sure to leave an extra comment for each entry!! Hey Liz! I feel bad for entering something again lol :( but my favorite bag is the Gray Stripes and Vintage Buttons Reusable Bag/Tote. I love the buttons on it! I really did like the interview though. I like talking about more than free stuff for sure. Soap nuts are the shell of something that contains soap that is released in water. If you search soap nuts you can get much more specific information. I order mine online. Thanks Liz!! What a great article. I love it! Linda's products are the best!! I've purchased them and they are very well made and colorful. What a wonderful interview. I'm inspired by your desire to help your community and the food bank. Great article. Congrats to both of you (interviewer/interviewee)! Linda, I have an idea for your left over t-shirt necks! No, I do not want them.... I have enough of my own:)I'm going to send you a convo. I love the oscar the grouch bag. He was always my favorite (I could relate)! Love the color of this Yellow daffodil sweater tote! Following Fashion Green T Bags on Twitter under @IMIS19. I like Fashion Green T Bags on Facebook, under the name Elizabeth Simi W.
The Snoopy Bag is TOO CUTE! !I love the innovative fun use of t's!great job! I'm now following on Twitter :) and will tweet!